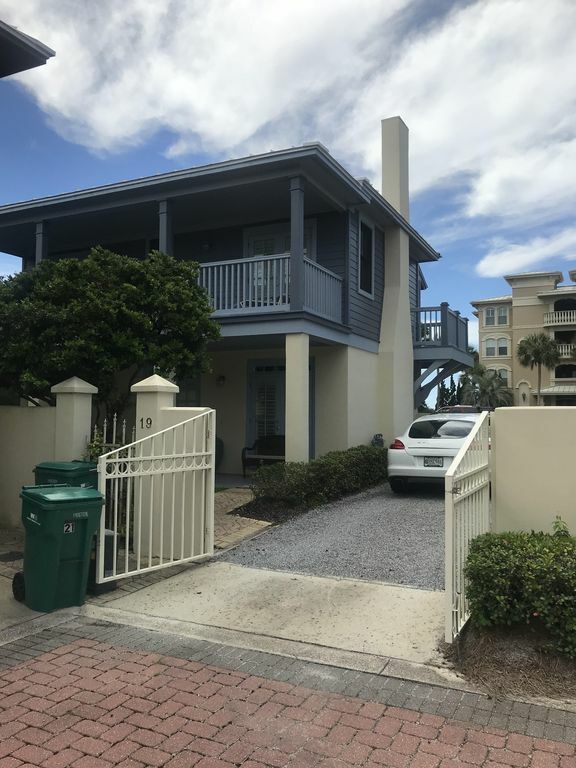 This great beach home is located within the gated community of Sunset Beach and a short walk to the communities of Rosemary Beach and Alys Beach. This trendy new area is about 12 miles west of Panama City on 30A. View of the ocean from the back deck and a short walkway to the beach. This house is less than 100 yards from the beach. You can be in the sand in 1 minute walking out the back of the house past the large heated pool. This pool is for the guests of Sunset Beach and its property owners and faces the ocean. Great golf in San Destin (12 miles)and Camp Creek,a Tom Fazio design is one mile away. This Non-Smoking home was professionally decorated and has all the amenities that you would expect including a washer and dryer. Televisions in both bedrooms. The living area has both a large Flat Screen TV and DVD player as well as a gas-burning fireplace. Close to shopping centers and great restaurants all along 30A. IF you are looking for a quiet, relaxing time close to the beach but close enough to all the activities, this area is great. Sorry but we only accept rentals for one week or more. We are the orginal owners of this property. We take pride in maintaining the property to high standards both inside and out. Sunset Beach has its own access to the beach which is a short one minute walk from the house. Stairs down to the beach from the pool area. Steve was very helpful leading up to our stay and the place is very conveniently located and nicely set up. So nice to be able to bring our small dog, too. A great option. Great house, location and amenities. Loved our little blue cottage for the week. It was a perfect get away. The house had everything we needed and more. Very clean, comfortable and close to the beach and pool. Best of all this I was able to bring my fur babies. Will definitely go back. The Little Blue house is perfect! Love where it is in Rosemary/Seacrest area. Loved walking around in our neighborhood to the boardwalk to the beach, saw the most gorgeous sunset one night. Love to be near many fabulous restaurants, La Crema, Paradis, Havana grill in the Pearl boutique hotel, etc. Love the cottage home we lived it, has everything you would want, very comfortable, nicely decorated, etc. nice to,have a fireplace for the few cold nights we had, other days nice to sit on balcony and see,the beautiful view and the beautiful gulf. Sad to be leaving,this morning. We were glad to have you stay with us and hope you return. You were a great guest!! Steve was great! He always answered every question we had promptly. It was a beautiful and clean house. Perfect for myself and family. Convenient location, very nice area, short walk to beach. Overall very happy with our stay at Lil Blue. Small, but comfortable inside with all the amenities needed for vacation stay. I would strongly encourage new outdoor furniture on the decks. Very nice ocean view from back deck but chairs not very comfortable. 'Front' deck had only 2 rocking chairs and a broken chaise. Would be nice to have at least 4 chairs on the deck for cocktail hour. Very convenient location with only a short walk to the beach. Also, can easily walk to Seacrest and Rosemary beach town centers for dinner and shopping, 5-10 mins tops. Also, I hope Florida gets the 'private' beach situation resolved. Seacrest had literally 50 feet of beach available for all of Seacrest renters to use. Clearly, that is not sustainable and renters will choose other areas. People were setting up at 5am to get close to the surf. LaDolce Vita, a beach services company, took 95% of the beach! So, most beachgoers moved west down beach where realtors were walking along advising this was a private beach and you 'really should not be sitting here'. Of course everyone told them they would definitely be sitting right there. Would definitely rent again if beach situation is resolved. If not, there are ALOT of other options. This was our second stay at Lil Blue. We love the house and the location. It's a quiet community but once you step outside the gate you have all the restaurants, shops, etc. that you could ask for. Everything is within walking distance, including the beach. Just wonderful! Cleaning fees are included in the base fee. Florida Hospitality Tax of 11.5% must be added to the rental fee.